Signposting on this section is generally good. Note that the SIBIT route has some variants - and the signage doesn't distin­guish between the variants and the main route - so it's a good idea to have an idea of which bits of the route you want to follow - and which ones you don't. This tour takes you from Trapani on the western coast of Sicilia to Siracusa on the eastern shore, taking quiet roads, wherever possible. There's even a short stretch of cycleway. 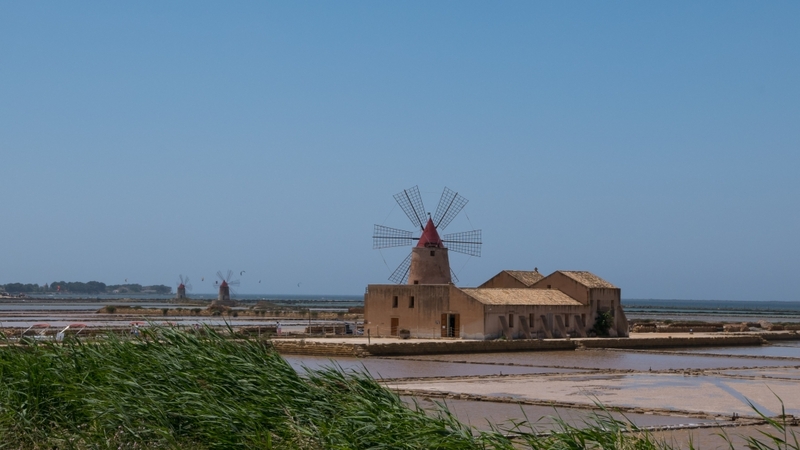 From Trapani it heads for the salt lagoons - one of the highlights of the tour - before heading for Marsala and the wine country around Mazara del Vallo. It then goes on to the arche­olo­gical site at Selinunte. After Selinunte it stops at Porto Palo (where there's an attractive beach) before taking in one of the very few cycleways in Sicilia which follows the route of the old rail line between Porto Palo and Menfi, and then on to the coastal city of Sciacca. From Sciacca the route heads inland through the orange-growing area around Ribera, and on to the coastal resort of San Leone (also known as the Marina di Agrigento). 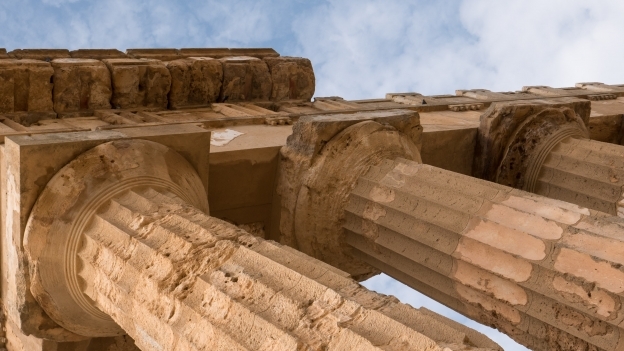 Between San Leone and Agrigento is the UNESCO World Heritage Valley of the Temples. 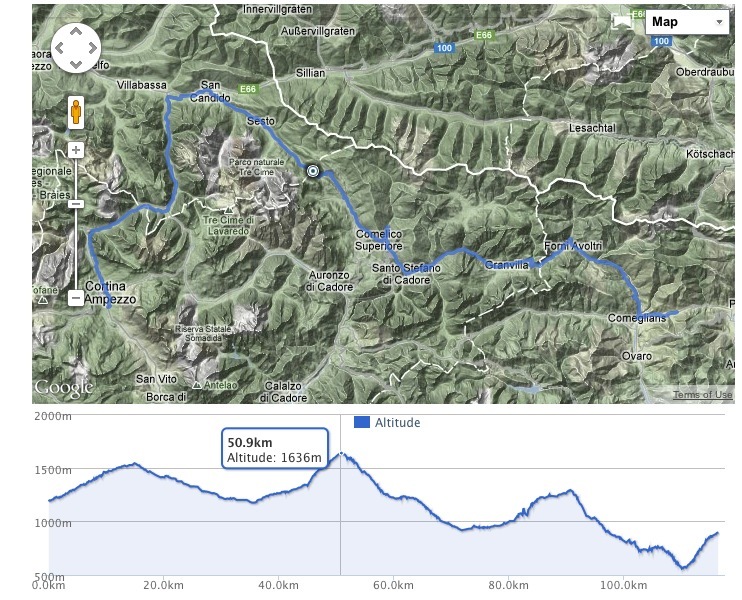 The route goes to San Leone rather than the city of Agrigento because Agrigento is quite difficult to get to by bike. 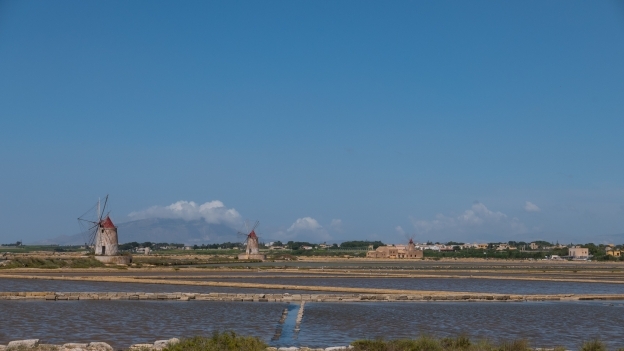 The Trapani saline (salt lagoons) were once the major salt-producing centre in Europe. Before refri­ger­ation, salt was the major way of preserving meat and salt. It was 'white gold' and its production and trade controlled by the state. The saline were located here because of the shallowness of the sea - you have to go out quite a long way before the water gets above your knees. The other ingredients in the production process are wind and sun - the wind powered the windmills that were used to pump the salt-water and the sun to evaporate the water leaving the salt. 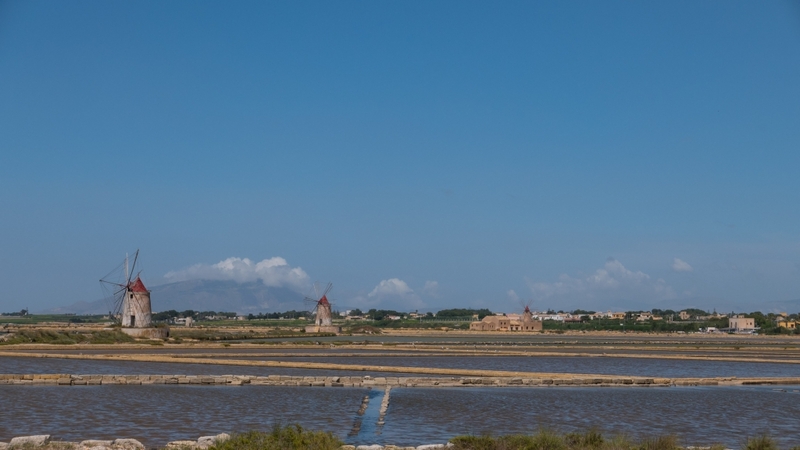 The Trapani saline are now a nature reserve run by the WWF (World Wildlife Fund). Most of the windmills are derelict but there are a few that have been restored, including one at the visitor centre on the road towards Marsala. There's also a Museo del Sale (salt) at Nubia which is worth a detour. The website for the nature reserve is wwfsalineditrapani.it but note that, according to Google, the site may be hacked. 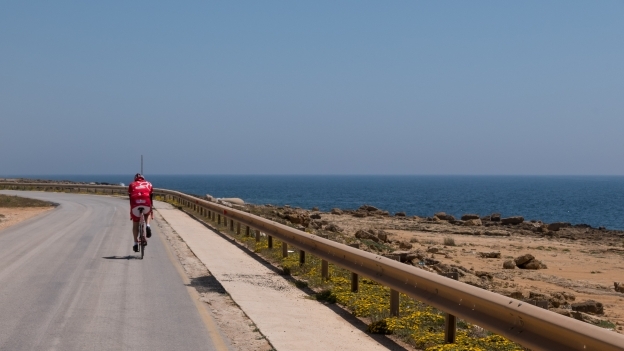 The road out of Trapani isn't partic­u­larly inspiring, and is fairly busy. However things improve a lot once you get past the airport and turn off following the signs for the arche­olo­gical site of Mozia, these take you onto a very quiet road – although the road surface is in poor condition. The Saline Ettore e Infersa with their three restored windmills are the most photo­genic of the saline along this stretch of coast. The Mamma Caura bar/​restaurant is almost an oblig­atory stop, to enjoy a drink or something to eat with a view over the saline (in fact if you want a drink or something to eat, it is pretty much the only place before Marsala). There are also three rooms (‘camere di charme’) in the complex. If you really are a glutton for punishment you can become a salt worker for the day. This is the embark­ation point for the boat tours to the remains of the Phoenician city of Mozia (en.wikipedia.org: Motya) ( opening times and prices). There is also the possib­ility of canoe tours (in fact you can also wade out to the island you really want to). The shallow lagoons and the wind mean this is also a popular place for kite surfing – there are at least a couple of schools along the way. The rest of the ride into Marsala is gorgeous, and one of the highlights of the whole route. The road to Marsala takes you past the most westerly point of the main island. On your left hand side looking out look out for the Baglio di Sant’Anselmo the museo is home to the remains of a Phoenician ship that date back to the third century BC (regione.sicilia.it: Museo arche­ologico regionale Lilibeo Marsala - Baglio Anselmi). The museum is housed in one of the old cantine (wineries) built for the Marsala wine trade. Many have now been converted, or lie empty, but you can visit the Florio and the Donnafugata cantine. The centre of Marsala is also beautiful, so as beautiful as the is, it's worth resisting the temptation to just blast past. After a little over 6 kilometres following the coast the route heads inland towards Petrosino and the wine country of western Sicilia. As you cross from Marsala there are boards welcome you to Petrosino "Il mare nell'uva" which doesn't really translate into English, but the trans­lator has had a go: "the sea within the grape”. As you ride there are vineyards on either side with rows of vines running to the sea and as far as the eye can see in the other direction. The vineyards are occasionally inter­spersed with other crops, but increas­ingly these seem to be being replaced by vines. 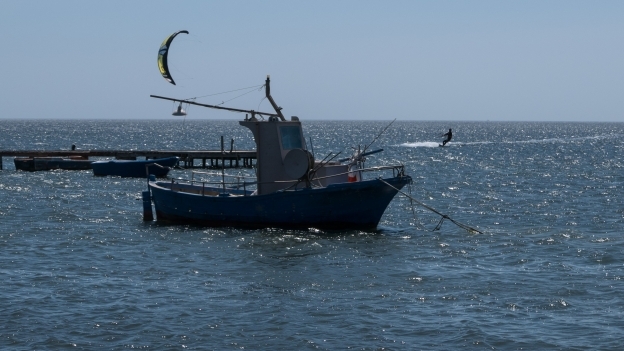 Mazara del Vallo is the base for Sicilia's largest fishing fleet, and tradi­tionally has close links with North Africa - the town has Sicilia's largest north African community. The town's star attraction is the Satiro Danzante (the dancing satyr). A Greek bronze sculpture found by a fishing crew from Mazara. The crew had first found a fragment of the sculpture's leg, and then, by an amazing coincidence, the same boat found the statue's torso some months later. The statue isn't complete but there's enough to see that it truly is one of the greatest works of art to have survived from the ancient world. The statue has its own museum (opening times and ticket prices). If you go, take the time to watch the video (subtitled) about its discovery and restor­ation - it's worth it if only to see the way that the face of the captain of the fishing boat lights up when he talks about the moment when they discovered the statue in their nets. From Mazara the road follows the coast before turning inland, towards Campobello di Mazara and Marinella di Selinunte. 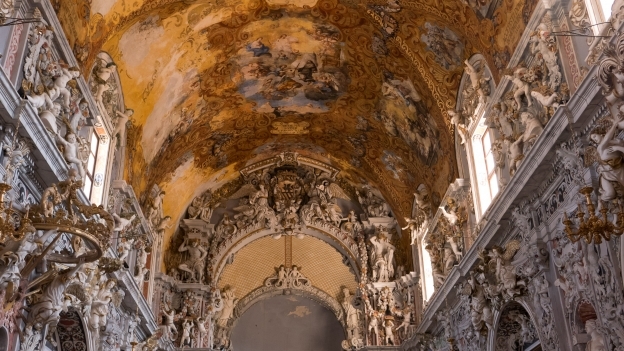 The main reason to go to Marinella di Selinunte is the arche­olo­gical site. The remains of Selinunte are very extensive, including two temples. Selinunte was locked in deadly rivalry with Segesta to the north. The rivalry brought about the destruction of both cities: Selinunte at the hands of the Carthaginians and Segesta by the Siracusans. There eight temples altogether - two of these are still standing - one just past the entrance and the other on the headland. It's a big site – the old city is quite a hike from the entrance. If it's hot, or you're pressed for time, the little golf-buggy trains would be worth consid­ering. For general inform­ation about the Selinunte site wikipedia is probably your best bet (en.wikipedia.org: Selinunte). You can also download a useful pdf map from selinunte.net. The arche­olo­gical park is open every day from 9:00 with last admis­sions at 17:00 (earlier in winter). Admission is 6€ (it's a a good idea to have the right money). Lillybeo Village is another small, welcoming, family-owned site between Marsala and Mazara del Vallo. In Marinella di Selinunte there are two campsites, almost next door to one another. I stayed at the Camping Il Maggiolino another small, friendly site. A couple of hundred metres down the road is the larger Athena . Both are a short bike ride from the village and the arche­olo­gical site.